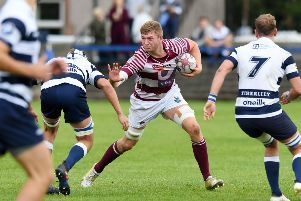 Heriot’s back rower Jason Hill has been handed the opportunity to create an impression in the professional ranks after earning a deal with Glasgow Warriors for next season. The 25-year-old has been training with Glasgow since February and has now been offered partnership contract at Scotstoun. The arrangement will allow Hill to continue to play for BT Premiership champions Heriot’s when he is not involved with Warriors, the Guinness Pro12 champions. Hill’s season was noteworthy for many reasons, including a spectacular try for the Scotland club international side in the win over Ireland and a last-ditch touchdown in the Premiership play-off final to secure victory against Melrose. He also harvested a brace of trophies at the Scottish Rugby Club Awards dinner, taking the title of BT Premiership Player of the Season and bagging the Brigadier Frank Coutts Memorial Try of the Season silverware. Now, Hill is relishing the opportunity the contract presents to move his career to the next level.